Your brand, simply put is who and what you are. What separates you from the commercial pack of similar businesses is what makes you unique and makes you stand out from your competition. So, if you want to be memorable to a consumer base that is literally inundated with hundreds of options in every industry, product, service, or form of entertainment, then you need to find a way to become the brand that corners the market of your particular consumer base. This is the philosophy behind branding: to make yourself or your business and product instantly recognizable. in a good way! And once they do, you need to keep them talking. When your product pops up in an ad, blog or simply comes up in the course of every day conversation, you want those exposed to your product to feel good about it and share their enthusiasm with their friends. Getting your customers to refer others to your business is not only free advertising but it also shows that people are obviously connecting with your brand. Word of mouth advertising shouldn't be viewed as just free advertising because it is so much more. In reality, it's priceless. Why? Studies show that when a friend recommends a product or service, you are more likely to buy that particular product over other similar brands or utilize one company over another based on those recommendations. And its more than just following a trend. You trust your friends; therefore you trust what they recommend. It is as simple as that. 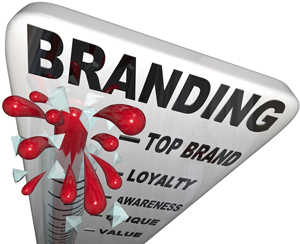 Is your brand recognizable? If not, you need to start aggressively making adjustments to make sure it is. What are the key components of your brand? Is your design unique? Does your logo and marketing materials maximize your company or product name in a way that is eye-catching and aesthetically engaging? Remember, consistency is key. So your website, business cards, social media content, and emails should all focus first on making sure your branding is not only consistent, but professional and unique. If your marketing budget is limited, spend what you have budgeted wisely by hiring a quality graphic designer and web content writer. Using stock art and generic graphics does not reinforce your value proposition and brand appeal. In fact, it has the potential of making the consumer wonder if you even believe you have staying power if you're not willing to spend the money to design an original logo and ensure your content is high quality. Image really is everything; spend the money to make sure the image you are creating for your brand looks like its here to stay. Creating a solid brand is neither quick nor easy. You are going to face challenges. You are going to face critics. You are going to probably feel like quitting. But if you believe in the business you are building and are working to build your brand into a truly unique, quality-driven, and memorable product or service, then press on. When adversity strikes, and you can almost count on the fact that it will, that is the time to take beat, step back, and look at what you have already accomplished. Then get back in the game. Your goal is to make your brand a hot commodity; turn up the heat and don't give up until you make it sizzle.